Taos, New Mexico—Before I can talk to Ariel Bui, I have to wait in line. A young woman, with a dusty blue scarf wrapped around her neck to keep still the flies, is inquiring about work. This isn’t exactly the best time, and it’s not exactly standard operating procedure, as far as job searches go, but she has a few good reasons not to take no for an answer: She just hitchhiked down from Colorado this morning and has nowhere to go from here—no place to stay, not even a contact—so this had better turn into something positive; and she has an idea: She’s heard about the Earthships. 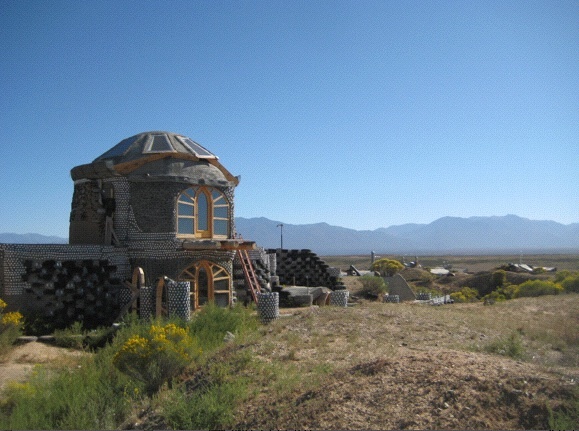 For the uninitiated, Earthships are the brainchild of a rogue architect named Michael Reynolds, who’s been building them since the 1970s. 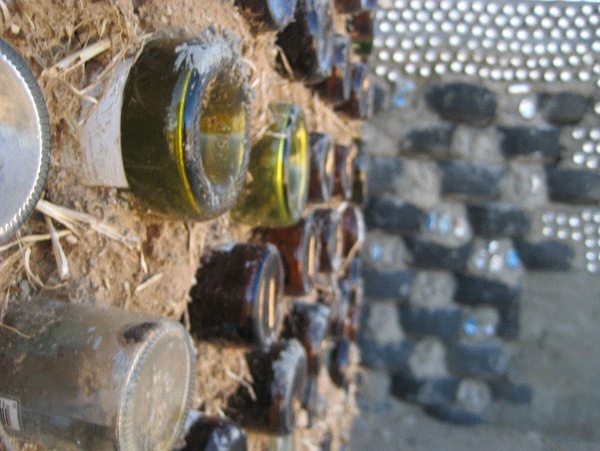 They rely heavily on a few core ingredients: Tires, packed with earth, form the thicker walls; glass bottles and tin cans (also filled with earth) help provide insulation, and depending on how creative you’re feeling, an aesthetic touch. Mud and straw, concrete, and papercrete (recycled paper pulp mixed with cement) do most of the rest of the work. 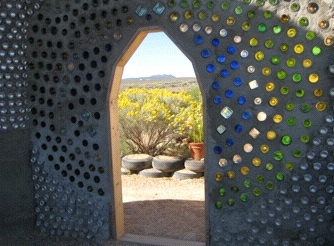 The windows are key, too, since a good earthship should also be naturally climate controlled. (Photo: Tim Murphy)Sometimes visitors will drop off raw materials, but a lot of it is acquired through other means. Like all the beer bottles. “Construction work involves a lot of drinking after work,” Ariel explains. The idea is to live entirely to almost-entirely off the grid (your custom-built Earthship can include a hook-up if you want one), and reduce waste to an absolute minimum. Hence the building materials, and the water filtration system (a relatively recent innovation by Reynolds, which collects rain water in cisterns, re-uses grey water, and puts black water* to use as fertilizer), and the power sources (wind and solar). Food can be grown on-site, outdoors and in greenhouses. From his base in Taos, Reynolds has expanded outwards, to Europe, India, Indonesia, Mexico, and, most recently, Haiti, where he’s hoping to show that the packed-earth-and-tires model can thrive outside its home in the high desert, and even withstand hurricanes and earthquakes. In his later years, Reynolds has collected another of those trappings of fame: disciples. At a hostel in Marathon, Texas, I spoke with an architectural grad student from England who’d come to the states specifically to train under Reynolds. She’d interned in east Texas, then renewed her visa and started experimenting on her own, constructing a half-dome sleeping quarters (it fits a bed and a laptop and not much else) out of sandbags and adobe. Ariel started off as an intern before graduating to a paid position at the flagship community in Taos. One last note: I’ve told you about the Marfa Lights, those possibly car-induced orbs that bop and weave over the Chinati Mountains in West Texas. Well, Taos has something called the “Taos Hum,” which is nowhere near as salacious to UFOlogists*, but still kind of endearing. It’s just a low-pitched drone that, according to skeptics (like my aunt), could very well just be coming from the power lines—but it’s their low-pitched drone. One Man’s Treasure: Michael Reynolds’ Earthships turn junk into building materials (Photo: Tim Murphy). *”black water” is just another term for sewage, not to be confused with the independent contractor and clothing retailers Blackwater (or “Xe”), which is also, in its own way, a form of waste.